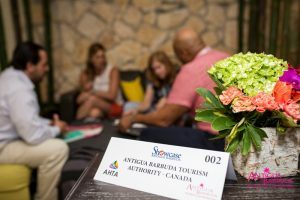 The Antigua Hotels and Tourist Association in collaboration with the Antigua & Barbuda Tourism Authority will be presenting the sixth annual “Showcase Antigua Barbuda ” on Thursday 20th June 2018 at the Royalton Antigua . This event provides one full day of pre-scheduled appointment sessions and activities where Wholesalers and Tour Operators from around the world can meet and conduct business with regional Suppliers in the tourism industry. Showcase Antigua Barbuda will include Suppliers from the Islands of the North Leeward Islands. These include Antigua and Barbuda, Dominica, Guadeloupe, Montserrat, Sint Maarten, St. Barthelemy, St. Kitts & Nevis. Since appointments are only scheduled through buyer requests and perfect matches, suppliers are encouraged to make advance contact with buyers they are interested in meeting. Appointments are arranged in advance through computer matching of pre-scheduled appointments requests received from buyers and suppliers. Appointments may also be scheduled on-site during the “Scheduling Sessions”. Participation in Showcase Antigua Barbuda is by invitation only. Buyers and Suppliers should complete the online registration and send the appropriate fee where applicable to the Antigua Hotels and Tourist Association, located at Island House, Newgate Street, St John’s, Telephone: 1-268.462.0374 . Single Tabletop Registration Fee includes 2 delegates; 1 tabletop and signage; listing in the Official Directory of Participants and on the Electronic Directory; 1 set of Appointments (maximum 22) during Showcase Antigua Barbuda; attendance to all food and social functions. Double Tabletop Registration Fee includes 4 delegates; 2 tabletop and signage; listing in the Official Directory of Participants and on the Electronic Directory; 2 sets of Appointments (maximum 44) during Showcase Antigua Barbuda; attendance to all food and social functions. Full payment must be received with your registration form in order to process. Tabletop sharing by different companies is not allowed. Additional delegate fee is US$175.00. Don’t miss the “Early Bird Registration Special!” (ending 31st March 2019). To get started click here and follow the instructions. Tabletops will be located on the media/marketing area on the selling floor with two delegate registrations – Limited to one tabletop per company. Computerized scheduled appointments will not be available, however, media/marketing/service companies will have prior access to the delegate list so that they may make their own appointments in advance of the event and invite suppliers to meet with them. Each tabletop is provided with one skirted table and 2 chairs. The registration fee includes listing and access to the Electronic Delegate Directory, access to all official events (Opening Cocktail Reception, Coffee breaks, lunch and Closing cocktail). All rates quoted are inclusive of Government Tax and Service Charge. For reservations, please e-mail Rossana Ferrari at: info@oceanpointantigua.com. To be eligible for these rates, delegates need to add “Show Case 2019” to the reservation requests. We would like to thank our partners without whose support this year’s event would not be possible.